The world is not a safe place. Around every bend, behind every tree, beyond the next sand dune lies fabulous wealth and imminent death. The path you take, the weapon you raise, the spell you cast - every decision you make brings you face to face with the creatures of Theah. Some wear human faces like the sinister Prince Villanova or the dreaded Captain Reis. Others are monsters with no earthly origin: man-eating sirens, the horrible Schattenmann and the inhuman Sidhe. 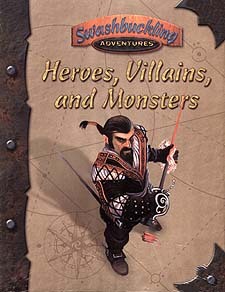 Heroes, Villains and Monsters contains a plethora of new threats and dangers for your swashbuckling campaign. You and your fellow adventuers will be called upon to uncover the world's darkest secrets and perhaps become the stuff of legends yourself. * Over 60 of Theah's most terrifying creatures, sinister villains and valiant heroes - complete with stats and guidelines for placing them in your world. * Numerous ready-to-play templates, suitable for any campaign. * Fully compatible with d20 System rules. To use this companion, a Game Master also needs a copy of Swashbuckling Adventures, the Dungeons & Dragons Player's Handbook and Dungeon Masters Guide. A player needs only Swashbuckling Adventures and the Player's Handbook.